This entry is meant to introduce you to the idea of Metal Halide H.I.D. lighting systems and how they open new doors for growing ornamental plants indoors. Where I live I am not allowed to have any type of Greenhouse behind my house (thanks to my Home Owners Association). Thus I’ve had to get creative and use an alternative means of keeping my vast array of Tropical Plants alive, especially those of the non-hardy variety. To do this I’ve had to make an investment in H.I.D. bulbs, ballasts, and hoods; and in doing so I can grow just about anything I could in a greenhouse from within the comfort of m own garage. Most of the information in this article comes from specialty-lights.com, a source we trust and buy from regularly to meet our needs for HID systems. So what is H.I.D. anyway? H.I.D. lighting stands for High Intensity Discharge, which is a special type of lighting that is much more intense than most other light sources available. HID lighting includes both High Pressure Sodium (HPS) and Metal Halide (MH) lighting. MH and HPS grow lights produce stronger, healthier seed starts, faster maturing plants, higher yields and increased flowering. HPS and Metal Halide lighting not only supplements sunlight but can replace it during the winter months entirely (which is what we do). The light spectrum range produced by HPS or Metal Halide light bulbs enhances the natural light derived from the sun. In addition HPS and Metal Halide lighting is energy efficient and only requires about the same amount of energy as a standard kitchen appliance. The life of MH and HPS bulbs ranges from 6,000 to 20,000 hours depending on the wattage and bulb type. In our case, we’re using Metal Halide bulbs only. Metal halides are extremely power plant lamp systems that produce a strong output of the blue spectrum, which will promote strong vegetative growth in plants. This blue spectrum is most needed by plants for rapid growth. It's the best type of light to be used as a primary light source (if little or no natural sunlight is available). If you are growing leafy plants such as most ornamental tropicals then a Metal Halide bulb is sufficient. 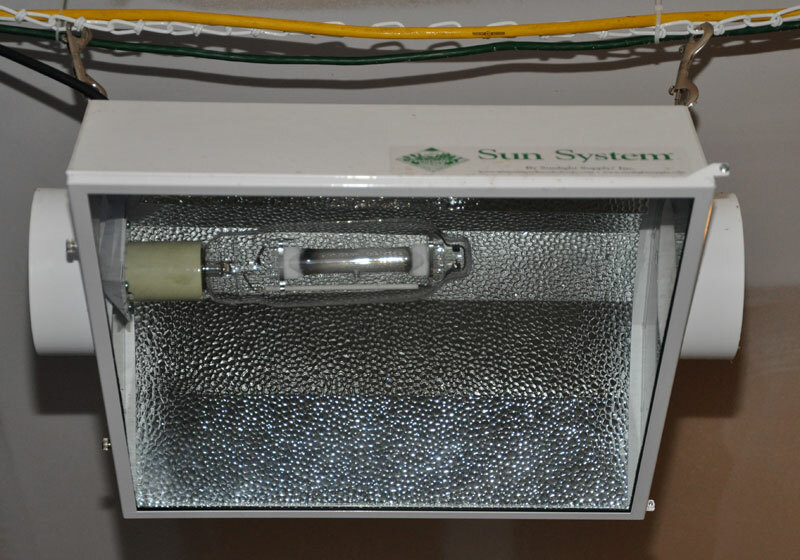 Metal halide plant growth lamp systems can be used as the primary light source to grow plants from start to finish. If you’re interested in learning more on HPS systems, check back in the coming weeks, as we’ll be talking about those as well. So why are HID’s so much more efficient than fluorescent bulbs or regular bulbs? That all comes down to how you measure light – which, and we won’t lie, can be quite complicated, but let’s dive in. If all the technical stuff doesn’t interest you, just skip to the next page. The "color" of light sources comes from a complicated relationship derived from a number of different measurements, including correlated color temperature (CCT) or Kelvin temperature (K), color rendering index (CRI), and spectral distribution (PAR Watts). However, color is most accurately described by a combination of Kelvin temperature and CRI. Color Rendering Index - CRI CRI is a numeric indication of a lamp's ability to render individual colors accurately. The CRI value comes from a comparison of the lamp's spectral distribution to the standard (e.g. a black body or the daytime sky) at the same color temperature. The higher the CRI the more natural and vibrant the colors will look. A bulb with a CRI of 85 or higher is excellent being that the sun has a CRI of 100. Standard Metal Halide bulbs have a CRI of about 70, so only 70% of colors will be rendered correctly. HPS bulbs have a CRI of 22. What is the Color Temperature or "K" - Kelvin Rating? The K rating is a generalized form of addressing the color output of a Light Bulb. Color Temperature is not how hot the lamp is. Color temperature is the relative whiteness of a piece of tungsten steel heated to that temperature in degrees Kelvin. HPS has a warm (red) color temperature of around 2700K as compared to MH at 4200K, which has a cool (blue) color temperature. The higher the kelvin temperature gets, the bluer. 10k lamps seem to be a nice crisp white, while higher kelvin can go from a blue/white to very blue and lower kelvin seem more like that of sunlight (6500k). Metal Halide bulbs go up to 20,000K (commonly used in aquariums) providing the bluest light. What is Spectral Energy Distribution & PAR Watts? The total visible spectrum is perceived by us humans as white light, but the "white light" is actually separated into a spectrum of colors from violet to blue, to green, yellow, orange and red made up of different wavelengths. Plants use the blue to red part of the spectrum as their energy source for photosynthesis. The different combination and the relative intensity of various wavelengths of light determine the CRI of a light source. Only part of solar radiation is used by plants for photosynthesis. This active radiation Photo synthetically Active Radiation (PAR) contains the wavelengths between 400 and 700 nanometers and falls just within the visible spectrum (380 - 770nm). The light in this region is called PAR watts when measuring the total amount of energy emitted per second. PAR watts directly indicate how much light energy is available for plants to use in photosynthesis. What is the Lumen Measurement? Lumen is a measurement of light output. It refers to the amount of light emitted by one candle that falls on one square foot of surface located at a distance of one foot from the candle. Traditionally, lumens have been the benchmark of a lamps ability to grow plants; meaning the brighter the lamp the better the plant. However, studies have shown that a broader color spectrum lamp will perform much better than a lamp with high lumen output, especially when it comes to plant growth. When it all comes down to it, HID systems are an excellent and safe way to provide quality light to your ornamental plants indoors over the winter months. Let’s go over the three parts to each system we run as an example. First you have the Ballast, which is what provides the power to the hood and powers the light. 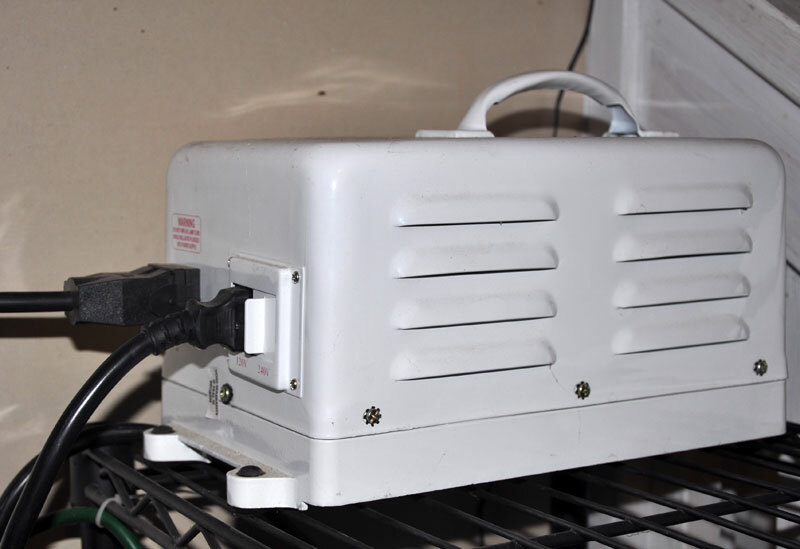 Each ballast must be matched with the proper wattage of light (400W, 600W, 1000W, etc). Second you have the reflector (or hood) that connects to the ballast and actually holds the light itself. For safety reasons it’s always a good idea to get hoods that have a glass shield in place to prevent any bulb incidents from scattering glass (for the record, we’ve never had a bulb burst on us). And last you have the light bulb itself. These can range in size and shape and come in many different wattages. 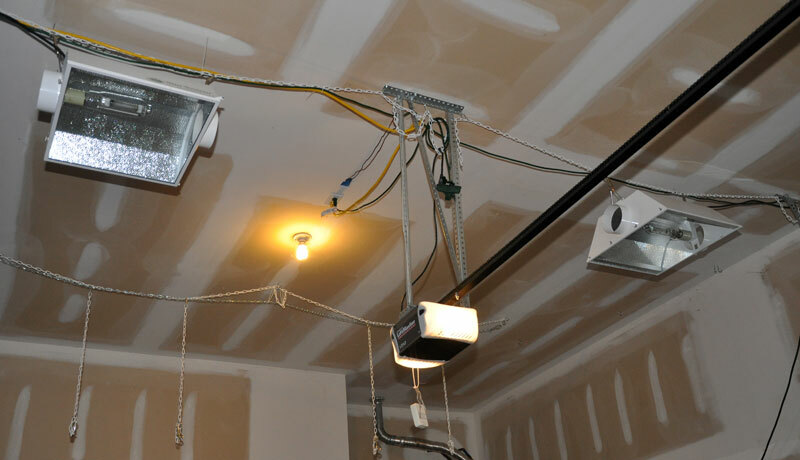 It’s very important your ballast be paired with the light wattage to ensure proper light safety. As you can probably guess, the remote ballast is one of the most important parts of the equation. Typically we prefer the remote ballast, where the transformer is a separate unit from the reflector, over the enclosed ballast systems. It’s easier to replace a remote ballast in our opinion and we like being able to hang the hoods without adding all the extra weight. Ballasts are heavy!! So to review, a complete remote ballast grow light system would consist of a ballast, reflector, socket & cord and light bulb. The ballast (transformer) is needed to ignite the bulb. The reflector or hood is what is used to direct the light and usually has a reflective insert to provide greater light intensity. Many of the reflectors now come with the socket & cord pre-wired into the hood. The average price for these systems ranges from $200-$400 depending on the quality of the system. You can spend less, or a lot more, but generally a system in the range above is sufficient. We have two 1000W systems and two 400W systems currently – all with remote ballasts and all with hoods that contain glass. Our systems give us a very nicely sized grow area. Speaking of grow area; you’re probably wondering how large of an area these lights give you to grow plants in. When deciding what type of light you’re purchasing, you’ll first need to consider the size of your potential grow area. The size of the grow area will determine the wattage you need. If we assume that the plants will get no sunlight, a 1000 watt light will cover about 8 x 8 feet of primary growing area (and 10 x 10 supplemental growing area). A 600 watt will cover 6 x 6 feet (8x8 supplemental), a 400 watt will cover 4 x 4 feet (6x6 supplemental), and a 250 watt will cover 3 x 3 feet (5x5 supplemental). These lights will light-up larger areas, but plants placed outside of the Primary Growing area in the supplemental region or beyond, will stretch and bend toward the light; a phenomenon called phototropism. Keep these areas of coverage in mind when using multiple fixtures. The best results occur when the areas of coverage overlap. Our two 1000W systems overlap one another, and our 400W systems overlap one another as well. The supplemental zones of both sets of systems also overlaps, giving us a total grow area of about 19ftx17ft in our garage. Another factor in how big your grow area is in how high you hang the lamps. The higher the wattage the further away you want the light to be from your plants due to the amount of heat. HID lighting will be further away than a fluorescent fixture because of this. When mounting your lighting fixture take into account the type of plant and how tall the plant will grow. You want to keep the light as close as you can, but not so close to burn the plant. A simple rule is “if it is comfortable for the back of your hand, it will be a safe distance for your plants”. Doing a little research on the type of plant and where it comes from will help in determining how much (or little) light your plants like. With fast growing plants, you may need to check the hanging height on a regular basis as plants that get too close to the lamp will be severely burned. And finally, you’re probably wondering how much this costs in regards to your electric bill. The math is actually not too hard to figure out. An average lighting system will increase your electricity cost about $8 to $20 per month. The exact amount depends on the wattage of the system and the number of hours operated. To calculate your cost, multiply the bulb wattage by the number of hours of operation and divide by 1000. This figure is the number of kilowatt-hours of electricity used. (Example: a 400 watt lamp running for 18 hours will use 7.2 kilowatt-hours). Check your power bill for the cost of each kilowatt-hour. Then multiply the number of kilowatt-hours used by the cost of a kilowatt-hour (K/hr) to figure the cost to run your light for that many hours. Then multiply that number by the number of days in a month to get the cost per month. Again, our thanks to specialty-lights.com, from which much of this information came. We have purchased all of our systems from these folks and have been very pleased. We hope you'll consider them for your HID lighting needs. That's an honest, non-paid, endorsement on our part. What is the season before Spring?